What do you think about when a storm comes into your life? When things are dreadful for you, how do you reflect on what’s happening? Where does your mind go? This article deals with those questions. I have a better shot at fixing the storm than bending God toward my desires. If I have a chance at managing my situation, it will be through my self-reliant efforts because I’m not sure God will cooperate with my desires? He may not want what I want, the way I want it, when I want it. I recently counseled a lady in a bad marriage. She has been in a bad marriage for nearly three decades. Her thoughts were predominately on how she had messed up and how her husband needed to change. Her way of thinking is normal for people in bad marriages. Why not hope and pray your marriage partner will change? It is a proper prayer, no doubt. If the other person changes, you will get what you want and be happy. What is missing in this line of reasoning is what the Lord might want for both the husband and wife. 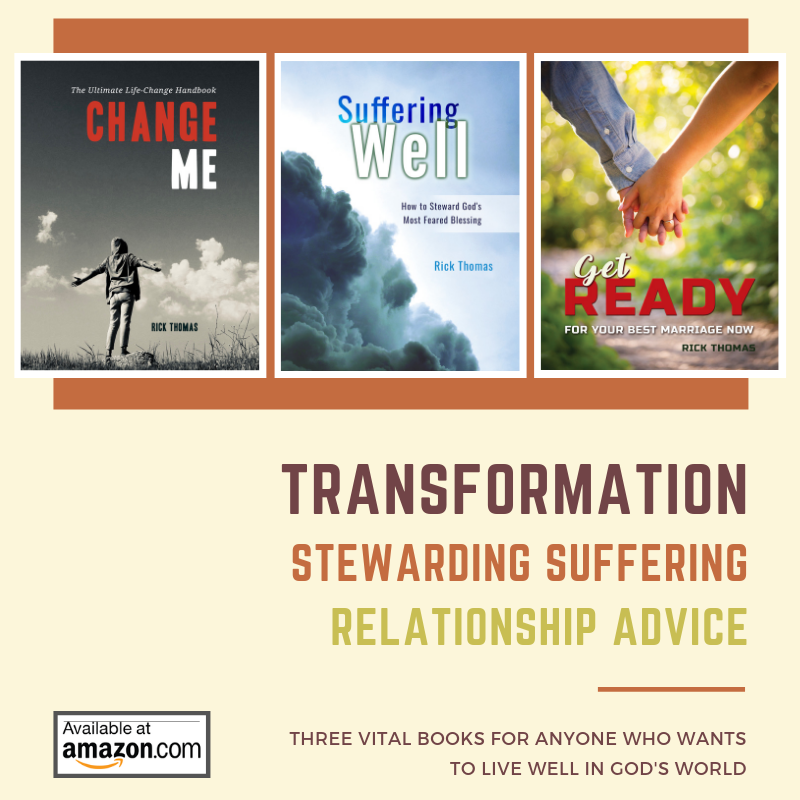 While it is wise to make sober assessments of how you may need to change or how your spouse needs to change, the more important thing to think about (and have your mind steadied) is the Lord who is in charge of the storm. While I affirmed my friend for carefully reviewing her sin and how she needs to change, I appealed to her to think more about her Heavenly Father, the Sovereign Ruler over all storms. It was hard for her to think how God might be in her bad marriage. He seemed to be a distant Influencer at best. Because it was my fault, things will not change unless I figure it out and make the appropriate changes. I suggested she re-prioritize who is really in charge of her mess. She may have made mistakes, but God is in charge. His grace always trumps our messes. But He is not just in our messes; He is super-attentive to our messes. He cares too much for us not to be in our messes, no matter how harsh our messes may be and no matter who appears to be the cause of our problems. Do you understand the depth of God’s love for you? I mean, really? Do you believe God may bring unremitting pain into your life because He loves you so much? If you are having trouble getting your head around this notion, let me remind you of the gospel. Carefully think through what you just read. You could say these things happened because of the evil of men. You would be correct. Just like how my friend understands her life went bad because of the “evil of men”—specifically, her husband. She is correct. Whether it was her sinful choices or her husband’s, her life has gone wrong in many ways because of individuals. But there is another way to think about the gospel story: God was orchestrating the gospel events, as the Gospel of Matthew reveals, (and her life) for His glory and her benefit. You must juxtapose and interact with man’s free moral will and God’s sovereignty. Both are valid and practical in our lives. Somehow man’s free choices work within the framework of God’s total control of all things. If you do not interact with these two truths simultaneously, you could quickly become an emotional shipwreck, especially when trouble comes into your life. God is in your mess just like He was in the crucifixion of His Son because you are important to God. You’re so important that He would orchestrate the crushing of His Son to help you. He loves you that much. He not only brought a storm into His Son’s life, but He will also bring storms into your life. We do not serve a sloppy or haphazard God. He is an active God, who gets into the details of our lives–even the sad details. He is in your business in ways that are beyond your awareness (Job 1:8). It is important that your thoughts about your troubles are about God and what He wants to teach you through the troubles. There are many illustrations of this in the Word of God. Jonah is one such instance. God had called Jonah to do a job, but Jonah did not want to do the job. So God hurled a great storm into Jonah’s life. He hurled this storm because He loved Jonah and did not want him to continue thinking and living as he had. God launches a storm into your life. God wants to get your attention. Your first thought must not be to run like Jonah but to discern what the Father has for you. Perhaps you would say God sent the storm because Jonah was sinning. That would be correct, but you cannot say God only sends storms to those who are actively disobeying Him. He may love a person who is sinning enough to throw a storm at him, the way He loved Jonah. My performance determines how God will interact with me. If I’m good, God will give me favor. If I’m bad, God will hurl a storm at me. Not only is this poor theology, but it makes a sinful judgment about the gospel. It says your righteousness matters to God and it lessens His judgment on Christ. Legalism is dangerous ground. You have no righteousness apart from that which Christ gave to you. It is His righteousness, not yours. If God dealt with you based on your righteousness, you would get more than a storm. You would get hell. It could be that God has brought a storm into your life for other purposes. Rather than trying to figure out whether you “deserve” the storm based on your performance, it would be better to ascertain what God wants to teach you. His storms are for His glory. His storms are for your good. You can bank on these things. Rather than getting angry at the storm or the person you think is perpetrating the storm, it would be better to huddle up with God and seek to discern why He is loving you this way. If you do not keep your eye focused on the God of your storm, your heart will go to some dangerous places. If you think more about the horizontal realities in your life–the people who may be causing your pain, your mind will trick you into sinful thinking. In Jonah’s case, God hurled the storm at him because He needed to save Jonah from himself. Rest assured that if God has you in a storm, He is seeking to do a redemptive work in your life in some way. Creating a storm is one reason parents spank children. The parent hopes the pain will warn and deter the child from continued self-destructive behavior. Don’t you agree? The parents discipline out of love. Though it is painful for a season, the reward can be eternal. A mature child will understand the “storm” is for his immediate and long-term benefit. If he is less about “getting out of trouble” and more about embracing the redemptive value of the storm, he will learn and mature because of it. God brought pain into Jonah’s life because Jonah was running from God. To some degree, we are all running from God. Think deeply about your storm. How does God want you to change? I am asking you a redemptive question. What Jonah did not understand, even through the storm, was how God could bestow His grace on undeserving people. He did not want to carry God’s redeeming message to the people of Nineveh. So God sent a storm into Jonah’s life to rescue him from his sinful way of thinking. Sadly, Jonah did not get the full redemptive meaning of the storm. He did not change. But God would not let go of His friend. So He sent a big fish to pick up Jonah to cool his jets for a few days. This second storm was sufficient. Jonah got the message from His loving heavenly Father, and Jonah changed. He repented. The personal redemptive purpose of your storm is the most important question you can ask when trouble comes because God is always in your trouble for a good reason. If you miss God, you will miss the point of your trouble. It is more important to discern God before you get too involved in your trouble. Here are some examples of wrong beliefs about God amidst a storm. If you believe God is not in your trouble, you are probably going to be discouraged or depressed. Trouble without God is a dangerous place to be. God is with you, even in your deepest trials. If you believe God is punishing you, you are going to head down the black hole of guilt and fear. God’s goodness to you should be your first and most sustaining thought when the storm comes. If you believe God is distant, you will seek to work out your problems without God. God was with Joseph, Job, Jonah, and Jesus. He is with you too. If you believe God is doing this because of your sin, you will have a distorted view of God. He is doing this because He loves you. Do not mock the gospel. The Father punished His Son for your sin, not you. God sends storms into your life to intercept self-destructive behavior. The key is whether or not you will choose to let go of the thing God wants to change in you. If you do not want to change, it does not mean God will stop pursuing you. When the storm came, Jonah refused to change. Then God sent a big fish, which gave Jonah more time to think about his situation. A large fish did the trick for him. When you run from God, expect Him to chase you down. He will not let you go without some stormy intervention. His love for you is so great, and His grace is so immeasurable that He will pursue you even if He has to send a fish to get your attention. A person in a storm is not entirely oblivious to what God could be up to with him. You may not know all of the things God is up to with you, but you will know some of the things He is trying to teach you. My friend began to discern some of the things God was working into her life through the storm. She had unresolved guilt, regret, bitterness, and anger issues. She also had a wrong view of God, as it pertained to why the storm was happening. She did not see God in her storm, thinking her poor marriage was all because of her “wrong” decision. Poor theology created relational distance between her and God. My appeal to her was to spend more time with God, thinking through these things. She needed God more than ever because her husband’s sin disqualified him functionally from leading and serving her. The last thing she needed to be thinking is that God is not in her trouble. He is right in the center of her problem, wanting to show Himself bigger than her problems. Having a God-centered view of trouble does not mean her trouble will change. Her marriage may never change, but her perspective and experience with God must change. Who knows—as God begins to change her heart toward Him, she may be able to present a clearer representation of the Savior to her husband. Once she learns to die to herself, she may have a more redemptive effect on others, one of whom could be her husband. Jonah became a minister of reconciliation when he stopped running from God. Isn’t this the case with us? Every storm God has brought into my life has resulted in some change. Once I stopped “running” from whatever way my heart needed change, my usefulness in God’s work increased. What is God teaching you about you? Rather than getting angry or fearful at the storm, lean into God. Discern what He is teaching you. Experience His love in your storm. When the Storm Hurler hurls the “big one” at you, stop and think deeply about what He is doing to you. His desire is to remove all of you from yourself, so your satiation and reliance are on Him completely. You will know when you have arrived. You will be a grateful person rather than an angry or complaining person. One of the characteristics of broken people, who are strengthened by God, is their gratitude. Paul did not get a change of circumstance, per his request. He got God instead, which empowered him to function in spite of his troubles. Through his weakness, God’s strength was made perfect.